Russian President Vladimir Putin and his South Korean counterpart Moon Jae-in attend a meeting during the Eastern Economic Forum in Vladivostok, Russia, Sept. 6, 2017. South Korea is planning to deploy additional launchers of a controversial U.S.-built missile defense system, a further sign of escalating tensions and a diplomatic stalemate over North Korea's growing nuclear weapons program. The Defense Ministry announced Wednesday that four more rocket launchers that make up the Terminal High-Altitude Area Defense system will be installed along with the two launchers that are already in operation at a former golf course in the city of Seongju, located south of Seoul. The deployment of the THAAD system is bitterly opposed by China and Russia, who view the powerful radar-based system as a threat. FILE - A Terminal High Altitude Area Defense (THAAD) interceptor (right) is seen in Seongju, South Korea, April 26, 2017. 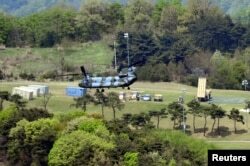 The additional THAAD launchers are being deployed just days after U.S. President Donald Trump and his South Korean counterpart, Moon Jae-in, reached an agreement to lift payload restrictions on South Korean missiles, in response to Pyongyang's latest nuclear test on Sunday, which it claims was an explosion of a hydrogen bomb. Along with the increased military stance, President Moon explored a diplomatic solution to the standoff Wednesday during talks with Russian President Vladimir Putin on the sidelines of an economic summit in Vladivostok. Both leaders agreed that North Korea must end its nuclear and missile testing programs, but Putin once again rejected imposing further sanctions on the isolated regime, insisting that negotiations are the only means to resolve the issue. The South Korean leader urged his Russian counterpart to consider blocking oil shipments to the North, as well as preventing North Koreans from working in foreign countries. China, which is North Korea’s only major ally, also contends that further tightening sanctions against Pyongyang will do little to ease tensions on the Korean peninsula. 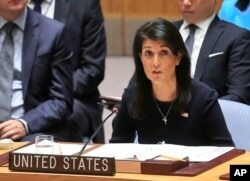 The United States this week is circulating a draft of a new resolution about North Korea at the United Nations, hoping for a Security Council vote next Monday. Trump has vowed to stop all U.S. trade with any country doing business with North Korea, and Treasury Secretary Steven Mnuchin says he is working on details of such a plan, which would primarily target Pyongyang’s neighbor, main trading partner, and strategic ally, China. More than 90 percent of North Korea’s export earnings come from China.